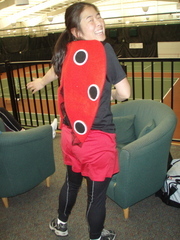 Halloween is just around the corner, but I already had an opportunity to don a costume at a recent tennis halloween mixer. 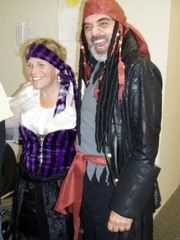 It was great fun with 21 participants, lots of tennis action and some fun costumes. My fav was the cereal killer (aka Art). 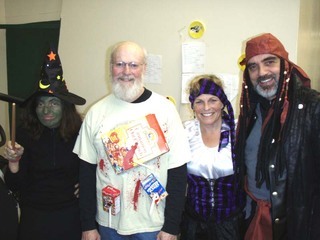 Excitement around the UAS campus is building and I'm looking forwarding to seeing all the great 2008 halloween costumes. I had a great opportunity to end the summer season with a trip to Mt. Roberts. I made a promise to my friend Lewis I would go up to the tram this summer. Unfortunately, my schedule didn't afford an opportunity until the day before the end of the season. 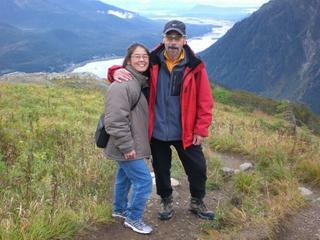 It's fairly common knowledge that Lewis was diagnosed with pancreatic cancer this past February. So we've made opportunities to do some things like driving the Corvette, sharing some ice cream or having lunch. I've known Lewis for about 17 years. We met as undergrads at UAS where we had many of the same business classes. Our paths would cross several times throughout the years like when I learned his dad and I were both members of the Juneau Gun Club. Lewis is a pretty incredible shot himself and is a former junior state champion in trap shooting. 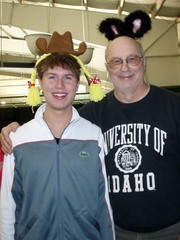 (It took me a while to connect the dots and figure out Lewis and his dad, Jim, were related.) In 2000, I tried tennis out on a whim. Who would have guessed I would get hooked and many years later, we would eventually become competitors. Our little journey to Mt. Roberts was blessed with good weather. 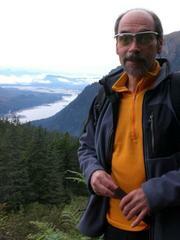 It sprinkled a bit, but otherwise, the temperatures were moderate and the visibility was great. All good things when you considered I locked myself out of my car on my way to pick up Lewis. So I had no jacket and my hiking boots were peering at me....from inside my locked car. Thankfully, I was wearing sneakers (instead of my typical work heels) and I had already changed into my thermal and fleece shirts. We rode the tram (okay...remember the days when you had to hike to get up there!) 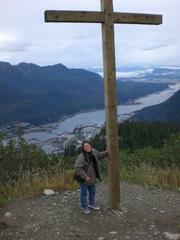 and hiked to the cross. I was impressed at how well Lewis was able to keep a steady pace despite the incline. We reached the cross in about 40 minutes and then we hung out at and around the cross. We got to see a bear and a bunch of goats such doing their "thing" on the mountainside. There's nothing better than seeing wildlife in their natural surroundings. I had a great opportunity to share my love for shotguns by teaching some friends this past weekend. 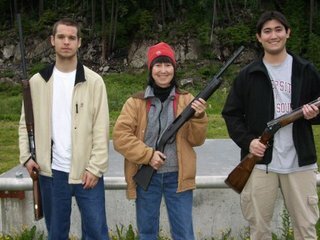 Fumi and I have been trying for years to get her son, Bryan, out to the shotgun club. I guess the stars were finally in alignment because we actually made it happen. They were all great students...though Matt seemed the most natural of the group. 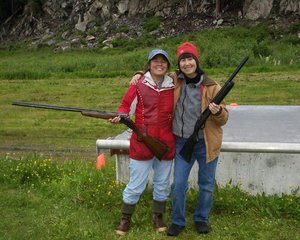 This was the first time for both Bryan and Fumi to shoot a gun. We started from right behind the trap shouse and eventually moved back to the 16 yard line. Everyone broke targets and enjoyed seeing their targets break into a million pieces. Here is the slideshow of photos from the 24 Hours of Light. Click the link to watch the slideshow in full screen mode. These were actually taken a number of weeks ago. There is a period in the summer at my house when there is serious Wild Kingdom activity...and this year was no exception. For a while, I was having 2 - 3 bear sightings a day in my yard on top of deer visits. On this occasion, there was a sow and a big ole cub mackin' out on grass. They stayed well past 10pm working their way from one end of the field to the other. My only regret is I didn't have a better camera. My zoom is not the greatest and I really wasn't interested in getting much closer for fear of agitating mama bear. 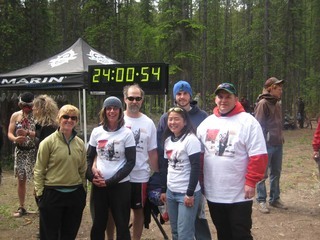 The annual pilgrimmage to Whitehorse for the 24 Hours of Light Mountain Bike Race is now complete. 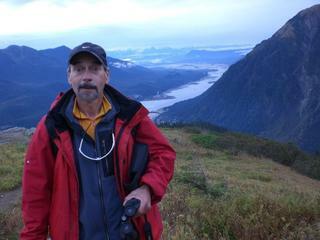 I had a great time with the folks from the Juneau and our awesome hosts from Whitehorse (Devon...you rock!). What an incredible event filled with fun, sweat, no tears (this year), lots of laughs and good times. In all, I believe there were 7 teams from Juneau. (4 soloists, 1 two-person team, 1 four-person team and 1 six-person team competing in the 8-person category). Congrats to Jill for her solo win as well as Janice and Rob for winning their division. Rob not only did 10 laps...he did so having not rode a mountain bike in years. Kudos to Troy, Busto, JB and Shea for rocking the house with 32 laps and the men's 4-person win. My team (Invasion of the Barbie Snatchers) finished towards the middle with some spectacular rides from Jim and Sheila pulling a quad and triple lap rotation in the middle of the night. Me...I came home with one iddy biddy little bruise. No major crashes during the race and nothing but smiles. More pics are on the way. I decided to surprise Onyea (my little sister from BB/BS) by taking her to the Juneau Raptor Center fundraiser at the Mount Robert Tramway. From the pictures, you'll be able to discern that we didn't have a lick of fun. Despite the yucky weather, we still had opportunities to see the view as the fog came and went and I discovered Onyea has a fear of heights when near the edge of a viewing area. While at the tram, we got to visit with Phil the Falcon who was not born with all the feathers necessary to fly. Thankfully, someone rescued him very early. Phil's favorite food is quail and I was amazed how he was totally at ease with all the people and even flash photography. So the coolest part of the day was listening to Onyea talk about how she hoped we'd still be a big and little even when she's "much older." 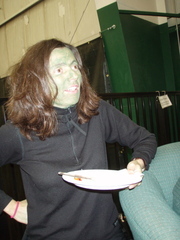 I just spent a long weekend in Santa Cruz, California where I attended an amazing mountain bike camp for women. The instructors were all accomplished riders, some former and others current riding professionals. They were humble yet confident, very encouraging, uplifting, and most important in my book, fun! I had several crashes none that were very dramatic but enough to come home with a few black n' blue spots. While is California, I was able to see my sister, niece and nephew as well as take in a few sights light Watsonville (beautiful farming community) and Monterey. Oh...and the ocean. I got to see the beautiful waves and smell the salty air. It was amazing!